“We’re not breaking any laws,” one pastor told an Alabama television station. ONLY WHITE CHRISTIANS are welcome at a cross-burning ceremony in Alabama organised by a sect that considers white Anglo-Saxons to be God’s chosen people, local media said today. “Sacred Christian Cross Lightning Ceremony (Open to all white Christians)” is the final event of three-day annual pastors conference organised by the obscure Church of God’s Chosen of Beaverton, Alabama. “We are not breaking any laws. We’re not violating any ordinances,” conference participant pastor Mel Lewis told Huntsville, Alabama television station WAFF. “We’re bringing the word of God to people who want it, obviously, or they wouldn’t be here,” he said, beneath a string of flags and banners that included one for the white supremacist Ku Klux Klan. 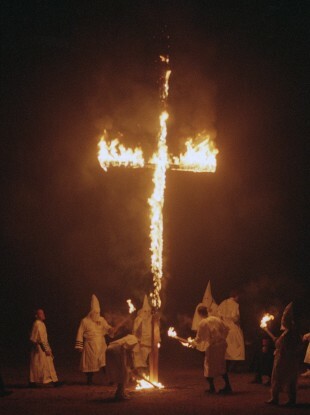 Cross burnings recall the dark days of racial segregation when the Ku Klux Klan — which lingers today as a fragmented network of a few thousand far-right extremists — prevailed across the southern United States. But the leader of the Church of God’s Chosen, William Collier, told WBRC television in Birmingham, Alabama that his church is not a hate group. He also said it never gets invitations to Jewish or Muslim events. Email “Whites only welcome at Alabama pastors' cross-burning”. Feedback on “Whites only welcome at Alabama pastors' cross-burning”.